A glider flying right over a motorcross track while out shooting. Saw the moon and hoped it would come out. Post Processing: Resize, Adjust Levels. Message edited by author 2004-03-15 14:32:36. Excellent photo Tina. But I that doesn't look like motorcross to me. Congratulations. This is a wonderful photo, and congratulations on your ribbon. Message edited by author 2003-12-25 13:53:16. It.s a shot worthy of the high placement - congratulations. What a nice surprise on Christmas. I was out shooting a friend of ours at a Motocross track in the East Valley. He'd just come off the track for a break, so I set my camera down for a break also. I started hearing comments "look, check that out". Turned around and there they were. Made a quick reach for the camera and didn't have much time for focusing, set up, etc. they were passing us by. The first couple shots I took didn't have the moon in it. The last one I saw the moon in the viewfinder and remember thinking: I hope this turns out. That's how I got this one and now I'll be heading out to try and 1) find this guy and 2) get more shots of them. Congratulations on your first ribbon, score another one for the AZ team! Where was this shot taken? 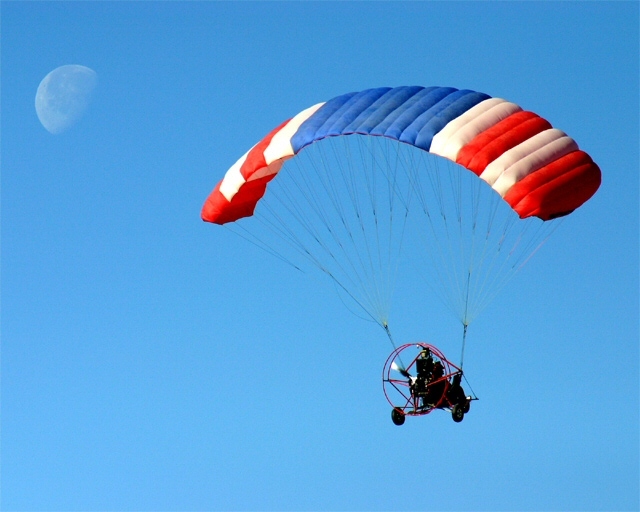 I�ve always wanted to try flying one of those things. I�m looking forward to the Jan get together. Just let me now where and when. P.S. Don�t let Steve know that I�m coming, I�m afraid of what he may do. Message edited by author 2003-12-24 15:34:50. Yeah! I;m glad you won a ribbon! Too bad people get DQ-ed but I think you would have originally been here regardless, especially if those that did cheat didn't! Congrats! Well, there you are! I really LOVE this photo and think it deserved to place dq's or not! Congrats! One of the most unique images in this challenge. Technically very good and the moon in the frame puts this image a cut above most of the others. This should be a top finisher! Message edited by author 2003-12-24 14:00:15. I like the color here. Very cool! Nice job of getting the moon in there -- it really adds to the shot! Fantastic composition and colors. Lunar flight, so cool. Really lucky to shot with this beauty moon on background. Verry well done. WOW ... love the colors!!! The moon is a very nice touch!!! Very good picture! max points! Excellent! Colors are vibrant and I like moon shots :-)! wow very nice composition... the slight moon on the left add the feeling here. The color and contrast between the subject and the blue sky are very nice. Proudly hosted by Sargasso Networks. Current Server Time: 04/23/2019 08:17:12 PM EDT.